The Motley Fool Canada » Investing » Barrick Gold Corp.’s (TSX:ABX) Massive US$6.5 Billion Bet: A Blunder or a Wise Move? Barrick Gold Corp.’s (TSX:ABX) Massive US$6.5 Billion Bet: A Blunder or a Wise Move? In one of the biggest developments in the gold industry in recent memory, gold mining giant Barrick Gold Corp. (TSX:ABX)(NYSE:ABX) will acquire Randgold Resources Ltd. (NASDAQ:GOLD) by Q1 2019 to create a new company (henceforth referred to as “the new Barrick”) that’ll be listed on the New York Stock Exchange and the Toronto Stock Exchange. Barrick Gold’s move comes at a time when gold prices are under tremendous pressure and miners across the board are striving to cut costs and boost productivity. Does the megamerger therefore bring good news for shareholders or will it prove costly for Barrick Gold? The merger will create a new Barrick with a market capitalization of nearly US$19.9 billion based on the market caps as of this writing. Barrick shareholders will own one-third, while Randgold the remaining in the new company. It’s therefore effectively an all-stock acquisition for Barrick Gold worth around US$6.5 billion as Randgold shareholders will get 6.128 shares in new Barrick for each share held. New Barrick will be the world’s largest publicly-traded gold mining company. Here are key statistics you must know in order to gauge the new company’s size and scale. New Barrick will own several of the world’s top tier 1 gold mines, primarily Goldstrike, Kibali, Loulo-Gounkoto, Pueblo Viejo, and Cortez. Tier 1 mining assets are typically large and low cost with a long lifespan. New Barrick’s gold reserves will be around 78 million ounces. For perspective, closest rival Goldcorp (TSX:G)(NYSE:GG) has gold reserves worth 54 million ounces. Additionally, the combined 2017 revenue for Randgold and Barrick Gold stood at US$9.7 billion– the highest in the industry. Finally, the combined total cash costs for the two companies last year was US$ 538 per ounce of gold, which is also among the lowest in the industry. In short, a huge gold mining company is taking shape. But there’s more to it than meets the eye. The deal not only adds to Barrick Gold’s depleting reserves, but also expands its geographic footprint into Africa. Now, geographical diversity is a huge competitive advantage to have in the mining business to mitigate geopolitical risks, but Africa isn’t really among the safest mining zones, so to speak. In fact, at least three of Randgold’s mines have been hit by workers’ strikes and unrest in recent months. In addition, a new mining code in the Democratic Republic of Congo could mean higher taxes and royalties for Randgold. Nonetheless, Barrick Gold could get a shot in the arm with this acquisition. You just have to see one chart to understand what I mean. Note that the chart reflects numbers in US dollars for consistency. 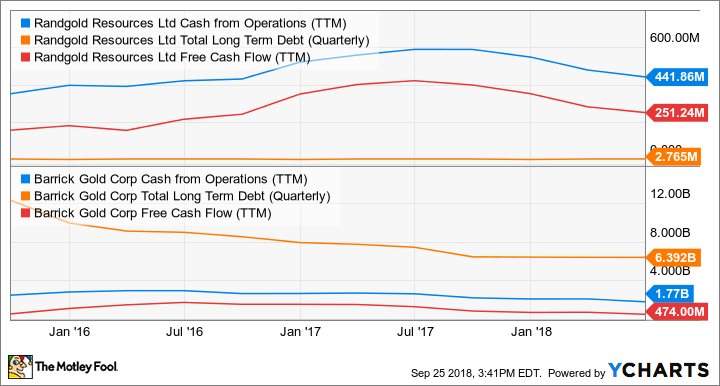 As is evident, Randgold is much more sound financially than Barrick Gold given its solid cash flows and low debt level. You might also be surprised to know that Randgold’s returns on invested capital averaged nearly 8% in the past five years compared with Barrick Gold’s negative returns. Barrick Gold therefore gets a cash injection from Randgold without the additional debt burden. It’s a win-win for any mining company. Meanwhile, I wouldn’t be surprised to see new Barrick offload non-core, smaller gold assets over time to focus on Tier 1 assets. Also, there’s a fair chance that the new Barrick will able to offer stable, even growing dividends as it monetizes its portfolio. All told, this looks like the beginning of a new chapter for Barrick Gold — one that should ring in improved returns for shareholders who’ve waited long to see the mining giant get back on the growth track. Fool contributor Neha Chamaria has no position in any of the stocks mentioned.